Do you know where to find the title for your car? How about your gas bill from last month? Where’s the receipt for the blender you bought last spring? 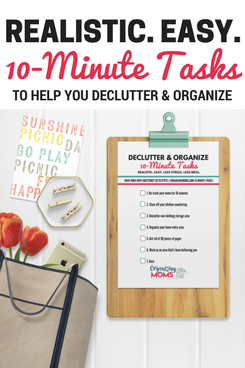 Are you in need of a good system to help you organize important paperwork as you figure out how to organize your home? Most of us don’t have a good system to organize important paperwork. We may have a filing system set up, but we rarely use it. And when we do use it, it’s hard to remember how we set it up and find what we need. Last fall I took a course on everyday productivity that helped me get our family’s paperwork under control. In that course, they recommended using the Freedom Filer system for important paperwork, so that’s what we did! We are still getting used to implementing the system, but having an actual system in place that I can trust has done wonders for our stress levels. 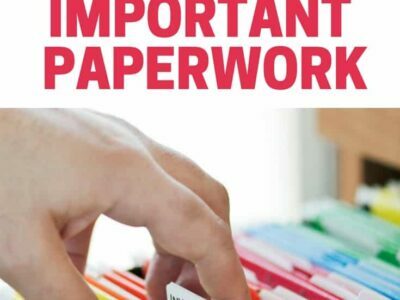 Why Focus On Important Paperwork? 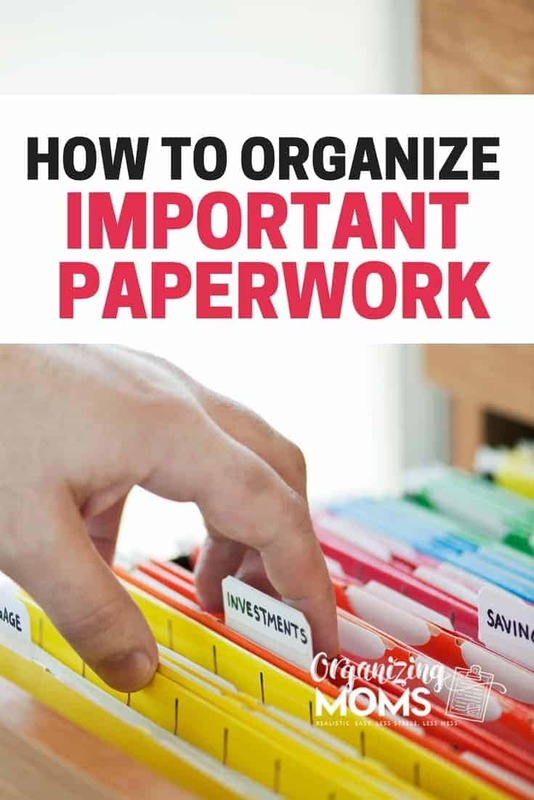 Focusing on organizing important paperwork seems like a no-brainer until you actually have to do it. Most of the time, important paperwork isn’t urgent or important at all. It’s something we can easily put off. Until we need to find something. Right away. Last fall we finally decided that it was time to trade in our old van for something more…safe. We knew our old van wasn’t worth much, but we were going to trade it in when we purchased our newish replacement van. We were all ready to head out to the car dealership to buy the new vehicle when we realized that we’d need to bring the van’s title in order to do the trade. But we couldn’t find the title. Clearly, we hadn’t taken the time to organize our important paperwork. Which meant we wouldn’t be able to trade in or sell our old van. I called around to try to get a replacement title and found out that it would take up to six weeks for us to get it in the mail after paying a hefty fee. It looked like being disorganized was going to cost us this time! I called up the dealership and embarrassingly told them about our situation. Thankfully, they said they would do the work of getting us the new title. We had to do some extra paperwork, but we were really thankful that they were willing to work with us. When I thanked them for their kindness, they told me that it was no big deal. People lose their titles all the time. It made me feel a little better to hear that we weren’t the only ones who couldn’t find our titles, but it amazed me that so many people would lose a document that proves ownership of one of their most expensive possessions. The Freedom Filer is a labeling system that helps you keep your important papers organized. It’s totally customizable for what you and your family need. My favorite part about the Freedom Filer is that it’s “self-purging.” The way you set up your files makes it easy to get rid of older, unneeded files. Because it’s set up this way, you don’t have to worry about going through and periodically cleaning out and re-organizing your files. When you order a Freedom Filer system, you can order the whole file folder set, or you can just order the stick-on labels. 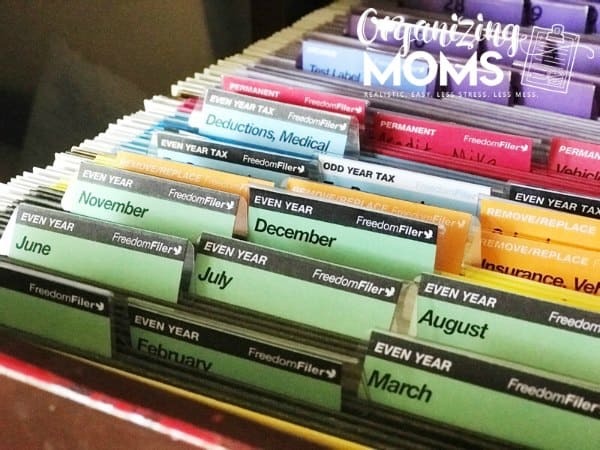 We already had a huge supply of hanging file folders, so I opted for the less expensive sticker set from Freedom Filer. I used the tutorials on the Freedom Filer website to help me get started with the system. Now, as new types of paperwork come into our inboxes, I sometimes add to what we already have set up in our Freedom Filer system. We’ve been using the system for about three months so far, and it’s really helped us get our important documents and paperwork organized. Click here to learn more about the different options from Freedom Filer. 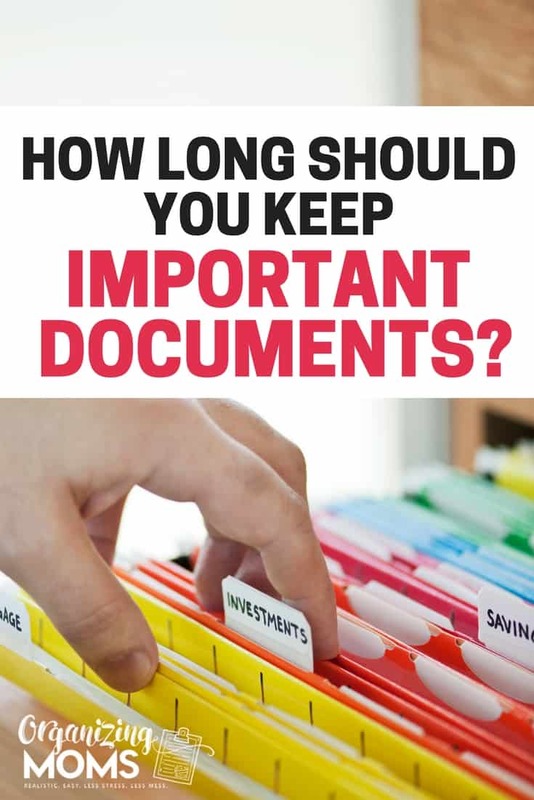 There’s a LOT of conflicting information out there about how long you need to hold on to important papers and records. Although I normally recommend minimizing as much as possible, in the case of important paperwork, it’s always best to err on the side of caution. 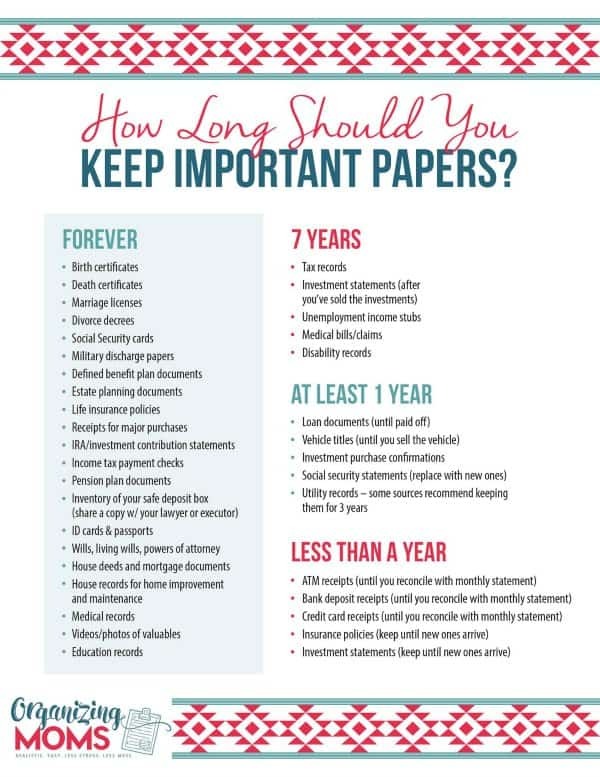 To help you make decisions about which papers to keep and which papers to toss, I’ve created a free downloadable cheat sheet that you can use when you’re trying to figure out how long to keep important documents. WANT TO REMEMBER THIS? 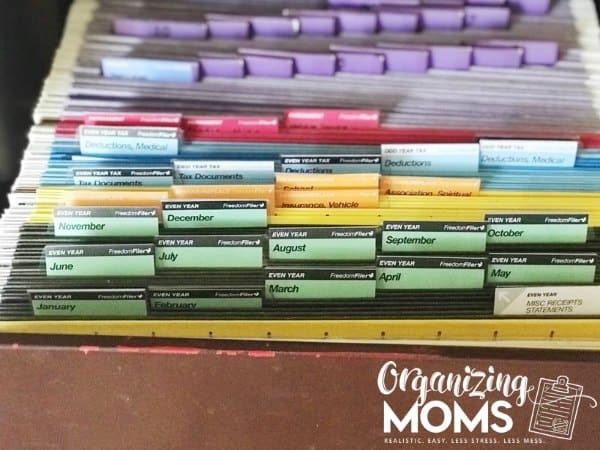 SAVE HOW TO ORGANIZE IMPORTANT DOCUMENTS TO YOUR FAVORITE PINTEREST BOARD.